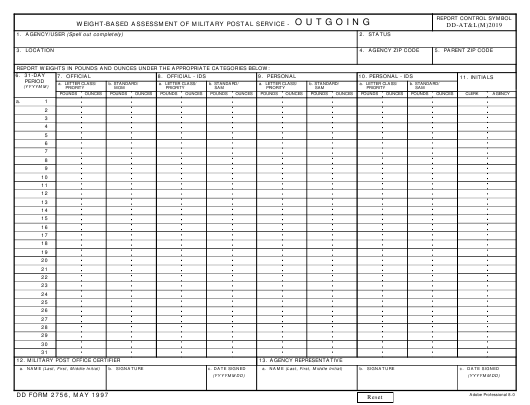 DD Form 2756 or the "Weight-based Assessment Of Military Postal Service - Outgoing" is a Department of Defense-issued form used by and within the United States Army. The form - often mistakenly referred to as the DA form 2756 - was last revised on May 1, 1997. Download an up-to-date fillable PDF version of the DD 2756 down below or find it on the Department of Defense documentation website. "WEIGHT-BASED ASSESSMENT OF MILITARY POSTAL SERVICE - OUTGOING"
Item 8. Labels the category of "Official - IDS" (Intra-theater Delivery Service) mail. a. Record total POUNDS and total OUNCES of Official - IDS "Letter Class/Priority"
column. (See Example in Item 7a.) Found in "ORANGE" bags. MPS as prescribed by law (See Note 3) and other governing directives. Item 9. Labels the category of "Personal" mail for assessment data collection. received by the agency/user on each day (See Item 6a) of the assessment in this column. out or pen mark out) and have agency/user representative initial change. (See Example in Item 7a.) Found in "ORANGE" bags. b. Record total POUNDS and total OUNCES of Personal "Standard" mail and "SAM"
unsure, request this information from user agency. assessment in this column. (See Example in Item 7a.) Found in "RED" bags. Item 2. Provide the responsible department for the agency/user if a Government activity. Item 10. Labels the category for "Personal - IDS" (Intra-theater Delivery Service) mail. a. Record total POUNDS and total OUNCES of Personal - IDS "Letter Class/Priority"
in their contract or authorization letter. Item 3. Identify the geographic location (e.g., Rota, Spain) of your MPO. Item 4. Identify the agency/user's ZIP Code to include +4, if used. the assessment in this column. (See Example in Item 7a.) Found in "RED" bags. Item 6. Report the numeric month and four digits of the year of the assessment. Example: 199705 for May 1997.
announced month. Example: May's assessment starts 1 May as day 1. Item 7. Labels the category of "Official" mail for assessment data collection. assessment period. Sign in ink and date. report ounces as a decimal. Found in "ORANGE" bags. b. Record total POUNDS and total OUNCES of Official "Standard" mail and "MOM"
ment in this column. (See Example in Item 7a.) Found in "RED" bags with MOM tag.